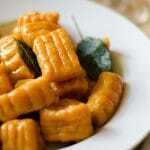 This Sweet Potato and Pumpkin Gnocchi is an autumn-inspired take on gnocchi. Fluffy, tender, and melt in your mouth with a creamy sage sauce. If you’re going to make the cream sauce, get this together first. Basically just mix all the “sauce” ingredients and we’ll get around to heating it later. To puree sweet potatoes, prick each with a fork a few times and bake at 350 degrees F (175 C) for 45 minutes until fork tender (either directly on oven rack or on a baking sheet). Remove skin and pass potatoes through a potato ricer (best), push through a wire mesh sieve (good), or mash until smooth (it’ll do). Baking is preferred over boiling in this case. Drier dough → less flour needed → more tender gnocchi. Mix sweet potato puree, pumpkin puree, egg, salt, and pepper in a large bowl. Add 1 ½ cup flour and mix only until flour is hydrated. If dough is still very sticky, add flour a few spoonfuls at a time until dough can be formed into a loose ball (it should still be pretty moist, the goal here is to use as little flour as possible). Nows a good time to get a large pot of water boiling. Transfer dough onto a floured surface and knead a few times. Portion dough into fist-sized balls, and roll each out to about 1 inch (2.5 cm) thick ropes. Cut the ropes into about 1 inch pieces (though the size is really to your preference...I prefer smaller gnocchi). Gently press one side of each gnocchi over the tines of a fork to create the classic ribbed appearance (I cheated and used a knife to form these little serrations). Again, while there is the classic Italian, shell-shaped appearance for these, let your preference guide you. No right or wrong! Gently drop each gnocchi into the boiling water. When the gnocchi floats to the top (a few minutes), it is done! Remove with a slotted spoon and set on a dry paper towel, face-up. Heat olive oil in a large saucepan over medium heat, then add whole sage leaves and minced garlic. Cook until the sage is crisp, just a few minutes. Remove from heat and add the gnocchi, tossing to coat. Quickly heat “sauce” ingredients in microwave. Cook for 30 seconds, stir, and repeat until sauce is hot and runny. Pour over gnocchi. Bon apetit! If you’re opting out of the cream sauce, use 1 or 2 more tablespoons of olive oil and an extra cloves of garlic in step 9. Recipe from Live Eat Learn at https://www.liveeatlearn.com/sweet-potato-pumpkin-gnocchi/.